12/16 Reagen Sulewski Not the mindtrip you might hope for. 71/85 Kim Hollis It left me wanting more somehow, but the dark atmosphere and Adrien Brody are enough to recommend the film. 106/166 David Mumpower The brilliant concept leads to abject disappointment at the result. The execution here is far too straightforward. The latest Steven Soderbergh production is sadly not being directed by Steven Soderbergh. Or even George Clooney. Who is John Maybury? I thought that was a character on The West Wing. The premise of the latest offering from the Section Eight team is intriguing. A presumed crazy soldier has a different take on life. 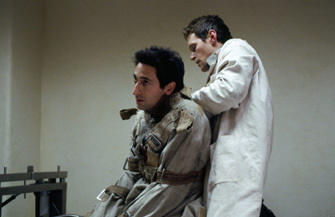 While serving time in a mental institution for a murder, he comes to believe that his jacket is the Members Only equivalent of a flux capacitor. Not only does this jacket look smashing as easily accessorized outerwear but it can also allow its wearer to travel back in time for some reason (if only Ron Howard were attached to direct...right, Simpsons fans?). Using the power of the jacket (and don't I feel ridiculous typing those words), the soldier plans to hop through various points in the space/time continuum in order to locate the woman of his dreams he only met once as a small child. Why in the world would anyone believe this man crazy? The catch here is that Kid Loco knows exactly when and how he is to be executed for his crime. Using this knowledge, he veers in and out of the time stream in order to alter the important events leading to his confinement. He has but one ally in this endeavor, a kind hospital worker who looks suspiciously like an adult version of that young girl Crazy Soldier Guy is looking for. As is the case with most Section Eight productions, the cast is superlative. Academy Award winner (for best acceptance speech in the history of the show) Adrien Brody and It Girl Keira Knightley frontline an eclectic group. Other notables are Kris Kristofferson, Kelly Lynch, Brad Renfro, and Jennifer Jason Leigh.